The VertuoLine system is different than Nespresso’s other models (including Lattissima, Essenza, CitiZ and Pixie machines) in that Vertuo machines not only produce espresso, but also brews fresh Coffee. The crema in the Espresso shots from the Vertuoline is marketed to be richer and fuller. Judging by an email I received a couple weeks ago, the new sub-$200 price is here to stay. 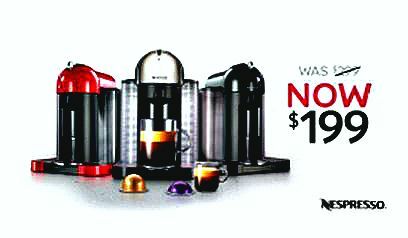 The announcement doesn’t have an end date as previous Nespresso promotions have had in the past. 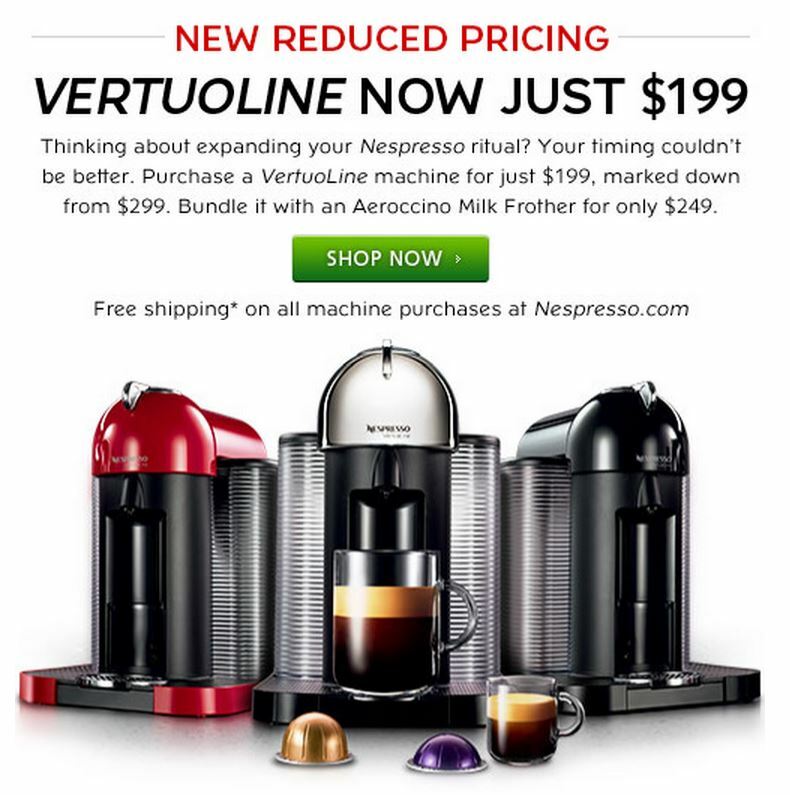 Specifically, the “NEW REDUCED PRICING” indicates that the 33% discount (original price $299) is a price cut and not just a limited-time sale on Nespresso machines. ww​w​.​nespresso​.​com, Nespresso® Mobile Apps and the Nespresso® Club phone number (800.562.1465), from April 29, 2015 through December 31, 2015. Offer not valid on machines purchased at Nespresso® Boutiques, other Nespresso® retail locations, or in connection with Nespresso ® Business Solution accounts. Offer only applies to an order shipped to a single address within the United States. Shipping charges apply for all other shipping options and destinations. Offer limited to stock on hand. Offer not valid on prior purchases, returned or exchanged items, or gift cards. Offer cannot be applied as a credit. Consumer must pay applicable sales tax. Offer not available to Nestlé employees or employees of already discounted partners. No cash value. Void where prohibited, or otherwise restricted. Nespresso® is a registered trademark of Société des Produits Nestlé S.A., Vevey, Switzerland.